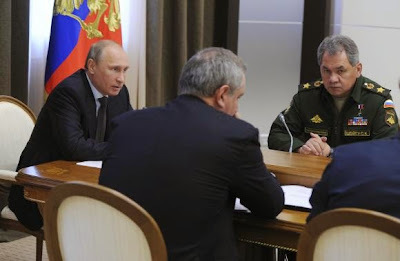 MOSCOW, Russia -- The Kremlin again announced on Monday President Vladimir Putin had ordered Russian forces near Ukraine back to their bases, but NATO and the United States said they saw no sign of a pullback and Moscow had failed to carry out such promises before. Russian President Vladimir Putin (L) and Defence Minister Sergei Shoigu (R) take part in a meeting with defence officials at the Bocharov Ruchei state residence in Sochi, May 14, 2014. Moscow has massed tens of thousands of troops near the border regions where pro-Russian separatists have declared independent states, and Kiev and its Western allies fear they could be used to invade in support of the rebels. Ukraine holds a presidential election on Sunday which Western countries consider a crucial event in resolving the country's crisis. The United States and EU have threatened to ramp up sanctions on Moscow if it interferes in the vote. Ukrainian border guards said there had indeed been a decrease in Russian military activity close to the border. But the United States and the Western military alliance said there was no indication troops had pulled back. "Unfortunately I have to say that we haven't seen any evidence at all that the Russians have started a withdrawal of troops from the Ukraine borders," NATO Secretary-General Anders Fogh Rasmussen told a news conference in Brussels. "We have seen no indication of any movement," Pentagon spokesman Rear Admiral John Kirby told Reuters. Putin declared the right to send forces to Ukraine to protect Russian-speakers if necessary in March and quickly annexed Ukraine's Crimea region, after a pro-Russian president was toppled in street demonstrations in Kiev in February. Armed rebels, many led by a Muscovite enthusiast of historical battle re-enactments, have seized towns and cities in eastern Russia and held a vote on independence which Western countries describe as a sham. NATO and the United States say previous Russian pledges to pull back troops - including an announcement by Putin himself on May 7 that they had already been withdrawn - produced no significant withdrawal. "Now I think it's the third Putin statement on withdrawal of Russian troops but so far we haven't seen any withdrawal at all," Rasmussen said on Monday. "I strongly regret that, because a withdrawal of Russian troops would be a first important contribution to de-escalating the crisis." In a sign of the lingering tensions, Russian Foreign Minister Sergei Lavrov said ties with the European Union and NATO needed a "substantial rethink" in light of the differences over Ukraine. The Kremlin said Putin had ordered troops in the three provinces of Rostov, Bryansk and Belgorod, which border Ukraine, to return to their "places of permanent deployment". It did not say how many soldiers would be moved away from border regions. Ukraine's border guards did not speak directly about a withdrawal but said they had noticed a decrease in activity by Russian forces across the frontier. "Before, we would see 10 or more aircraft flying along the border in a 24-hour period, and military vehicles would come directly up to the border. Now there are no such instances," border guards spokesman Oleh Slobodyan said. In another conciliatory signal, Putin welcomed what the Kremlin called initial contacts between the Ukrainian government and "supporters of federalization" who want more power for largely Russian-speaking regions in eastern Ukraine. Lavrov said Russia welcomed talks that have brought the government in Kiev together with regional representatives but voiced concern the pro-Western government could be using the talks as a "smokescreen" while pushing through constitutional reforms that would fail to give the provinces enough autonomy. Kiev, for its part, fears the Kremlin wants to weaken the central authorities and ensure Russia has sway over eastern regions by granting them strong powers. Putin and Lavrov both reiterated Russia's demand that Kiev end what the Kremlin calls a "punitive operation" against the separatists and pull back its troops. Kiev has launched a military operation against the rebels but has failed to dislodge them from their main bases in eastern cities.